When Iranian naval forces trained for an operation to potentially shut down the strategic Strait of Hormuz last week, the Islamic Revolutionary Guard Corps quietly tested a ballistic missile over the same strait, according US spy satellites. Fox News reported Friday that Iranian forces launched the Fateh-110 Mod 3 missile during Iran’s large-scale naval exercises to practice shutting down the Strait of Hormuz, citing information from a US spy satellite and three officials familiar with the matter. It appears to be Tehran’s first missile test of 2018. The missile took off from Bandar-e-Jask, Hormozgan Province, in southeast Iran, US officials told Fox, and traveled approximately 100 miles over the Strait of Hormuz before landing in a desert on Iranian territory. The flight path was “shore-to-shore,” one of the officials said. The Pentagon acknowledged Iran’s naval exercises but declined the opportunity to comment on the missile launch. “It’s pretty clear to us that they were trying to exhaust that exercise to send a message to us that as we approach this period of the sanctions, they had some capabilities,” US Gen. Joseph Votel, head of US Central Command, told reporters Wednesday at the Pentagon. Iran, however, regularly conducts naval drills near the strait, and the missile test was done in what amounts to Iran’s territorial waters, a US official confirming the test said, Reuters reported. Any disruption in the strait’s security would instantly spur chaos in energy markets and could maintain devastating impacts on national economies across the globe. Data from Lloyd’s List Intelligence suggest some 80 percent of crude oil flowing out of the Persian Gulf through the strait is destined for China, Japan, India, South Korea, Singapore and other Asian markets. “The Strait of Hormuz is the world’s most well-known oil chokepoint because its daily oil flow of about 17 million barrels per day in 2015 accounted for 30 percent of all seaborne-traded crude oil and other liquids. The volume that traveled through this vital choke point increased to 18.5 million b/d in 2016,” the US Energy Information Agency reports. About 30 percent of global liquid natural gas exports came from Qatar out through the Strait of Hormuz in 2016, BP’s “Statistical Review of World Energy 2017” found. Why is the TV show “SEAL Team” worth watching? Of the three major military dramas broadcasting these days on TV, the SEAL Team is the most sincere. The TV shows (Wednesdays, 9 ET/PT, ★★½ out of four) works mostly because it’s not reaching beyond its comfort zone. Following a team of U.S. Navy SEALs carrying out covert operations with the aid of the CIA (Central Intelligence Agency), it’s an uncomplicated action series without twists or unnecessary spectacle, at least so far. TV veteran David Boreanaz (Bones) plays Jason Hayes, the leader of the Tier One Navy SEALs, and he’s an intense and focused guy not unlike the FBI agent he played for so many years on Fox’s series. Jason’s home life has crumbled due to his dedication to his work, and he’s haunted by the death of a teammate on a recent mission. The cast is rounded out by Jessica Paré (Mad Men) as a CIA analyst and Max Thieriot as a young and ambitious soldier trying to make it into the Tier One unit. The TV drama plays to the strengths of its network, and its star. The missions are simple and paint the soldiers as patriotic and unimpeachably good. In last week’s second episode, Navy SEAL flirted with bigger questions about war and the state of the world, but all in the service of its core characters. The action is sharp, clean and often close up, prioritizing the soldiers’ points of view. 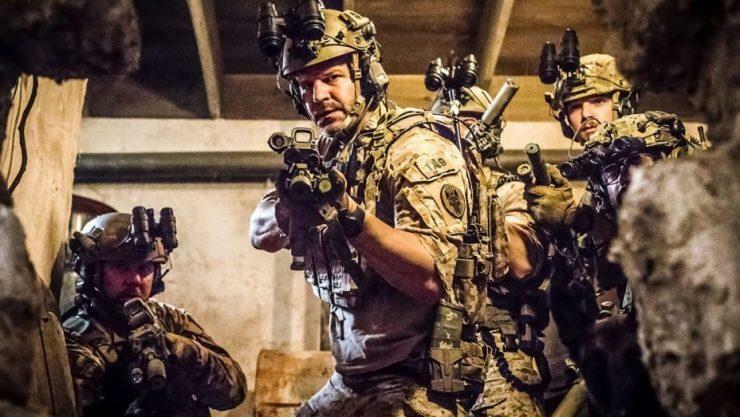 The lack of sensationalism is what makes Navy SEAL a stronger entry into the military genre this fall than NBC’s The Brave and CW’s Valor. The Brave is flashy, while Valor is twisty and ill-conceived, and neither has a cast as engaging. Special Operations Forces of Russia, or SOF (Russian: Силы специальных операций; ССО, tr. Sily spetsial’nykh operatsii; SSO) are strategic-level special forces under the Special Operations Forces Command (Russian: командование сил специальных операций; KCCO, tr. Komandovanie sil spetsial’nalnykh operatsii; KSSO, or KSO) of the General Staff of the Armed Forces of the Russian Federation. Formation of first units for future Special Operations Forces began in 2009 as part of the overall reform of the Russian Armed Forces. Special Operations Forces Command was set up in 2012 and announced in March 2013 by the Chief of the General Staff Valery Gerasimov. According to Gerasimov, the SOF was designed as a strategic-level asset, whose primary missions would be foreign interventions, including sabotage and anti-terrorism operations. SOF do not belong to any branch of the Russian armed forces and are not to be confused with special forces that until 2010 were under the GRU and whose subsequent subordination appears to be unclear. Russia′s SOF are manned exclusively by professional personnel hired on contract, in commissioned officer positions. The video compilation is showing various parts of Russian Special Operations Forces.